Fish are one of the oldest and most biodiverse groups of vertebrates inhabiting our planet. They populate almost all the earth’s waters, but their numbers are dwindling rapidly. It is particularly hard for us to imagine the world that fish inhabit. We rarely think of them as individuals – in most cases, we speak of them as collective beings, described in kilograms and tonnes. Fish stocks are rapidly shrinking around the world. For example, in the North Sea, the stocks of fish which are able to reproduce have plummeted due to absent or inadequate fishing bans or exorbitant fishing quotas. Today, over 90% of fish stocks are considered either overfished or exploited close to the point of unsustainability. This applies to cod in the Northwest Atlantic, as well as other species. Cod populations recovered, but only very slowly, after a dramatic decline at the end of the 1990s. Meanwhile, of the seven most fished tuna species, 41% are not fished sustainably.6FAO (2016): The State of World Fisheries and Aquaculture 2016: Contributing to food security and nutrition for all. Rome. Overfishing wreaks havoc on marine ecosystems. As well as the populations of species intended for human consumption, the stocks of animals caught as bycatch are also declining. Rampant fishing also causes immense damage to the seabird, jellyfish, and plankton populations.7World Ocean Review (2013): The Future of Fish: The Fisheries of the future. Available at: http://worldoceanreview.com/wp-content/downloads/wor2/WOR2_english.pdf [09.03.2018] Beyond the sheer volume of fish caught, the fishing methods used are especially damaging to ecosystems as a whole. Bottom trawl nets, for instance, which are used to catch plaice, sole, and crustaceans, destroy the seabed and the organisms living there, including corals. Aquafarms frequently breed predators such as salmon or trout, which require smaller fish as fodder, thus exacerbating the problem of overfishing.11FAO (2016): The State of World Fisheries and Aquaculture 2016: Contributing to food security and nutrition for all. Rome. 12Tacon A. G. J. und M. Metian (2008): Global overview on the use of fish meal and fish oil in industrially compounded aquafeeds: Trends and future prospects. Aquaculture 285, 1-4, S. 146 – 158 For example, sardines are being fished to the brink of extinction simply to satisfy the global demand for fishmeal. Although many people now reject the practice of hunting wild game, fishing is still widely perceived as a relaxing hobby – perhaps because most people do not realise that fish are sentient beings who can experience pain. Hobby fishing causes substantial suffering to fish: the hook produces deep wounds in the oral cavity, while the fish slowly suffocates after being taken out of the water. ‘Catch-and-release’ fishing is a similarly traumatic experience, even though the fish is thrown back into the water. After being released, the animals suffer significant stress and injury, returning to the water with substantially depleted reserves of strength and reduced chances of survival. As with the vast spectrum of land animals, fish also have strongly varying social systems.13C. L. Peichel (2004): Social Behavior: How Do Fish Find Their Shoal Mate? Current Biology 14, no. 13, S503–504 14R. E. Engeszer, M.J. Ryan and D.M. Parichy (2004): Learned Social Preference in Zebrafish. Current Biology 14, no. 10, S. 881–884. For example, trout are regarded as loners, while other fish species live as couples or form loose groups or large shoals (as is the the case with tuna). Fish possess long-term memories and are therefore able to establish complex social relationships. Additionally, they are equipped with spatial memory, allowing them to create mental maps that they use to navigate the waters.15C. Brown (2015). Fish Intelligence, Sentience and Ethics. Animal Cognition 18, no. 1, S. 1–17. The assertion that ‘fish do not feel pain’ is frequently used to stifle any discussion of whether fish are able to suffer. But the inability to scream simply means that the pain felt by fish remains invisible and unheard. It follows, therefore, that we do not generally experience the same pangs of conscience that we feel in relation to pigs, cattle, or chicken. 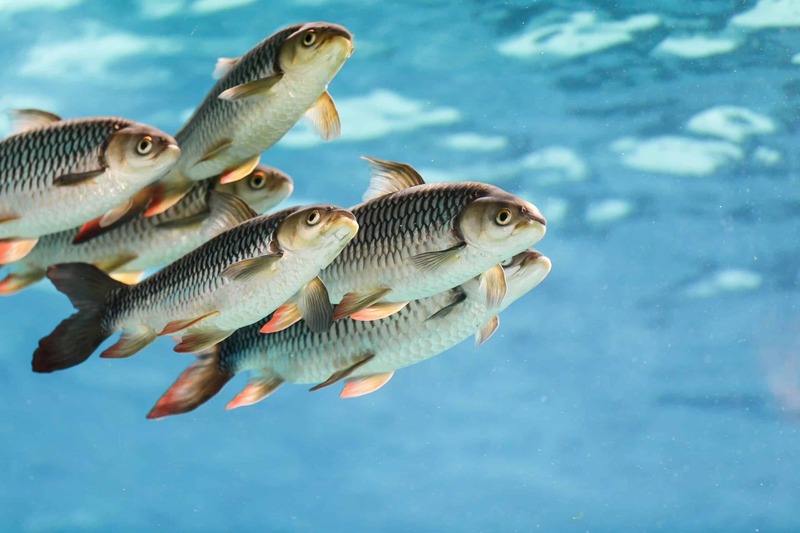 Nevertheless, researchers increasingly confirm that fish feel pain. Fish, like mammals, have sensory systems as well as cerebral structures and functions that are responsible for the perception of pain, fear, and stress.16L. U. Sneddon, V. A. Braithwaite, and M. J. Gentle (2003): Do Fishes Have Nociceptors? Evidence for the Evolution of a Vertebrate Sensory System. Proceedings of the Royal Society B: Biological Sciences 270, no. 1520, S. 1115–1121. 17Heath, A. G. & G. M. Hughes (1973): Cardiovascular and Respiratory Changes During Heat Stress in Rainbow Trout (Salmo Gairdneri). Journal of Experimental Biology 59, no. 2 (October 1, 1973): 323–38. 18Arends, R. J., J. M. Mancera, J. L. Muñoz et al. (1999): The Stress Response of the Gilthead Sea Bream (Sparus Aurata L.) to Air Exposure and Confinement. The Journal of Endocrinology 163, no. 1 (October 1999): 149–57 This is substantiated by behavioural patterns such as defensive reactions to pain stimuli.19H. Segner (2012): Fish: Nociception and Pain: a Biological Perspective. Contributions to Ethics and Biotechnology 9. Bern: Federal Office for Buildings and Logistics. Fish absorb and accumulate the contaminants contained in seawater. There is a pertinent rule of thumb: the higher up the fish is in the food chain, the greater the toxin concentration in its body. This is troubling news for those who are accustomed to eating popular species such as salmon or tuna25Gerstenberger, Shawn L., Adam Martinson, and Joanna L. Kramer. “An Evaluation of Mercury Concentrations in Three Brands of Canned Tuna.” Environmental Toxicology and Chemistry 29, no. 2 (February 2010): 237–42. doi:10.1002/etc.32. – large predators that feed on smaller marine creatures and, in doing so, absorb toxins that accumulate in their bodies and become increasingly more concentrated over time (this is known as bioaccumulation). People with a liking for fish will therefore consume mercury, PCB (polychlorinated biphenyls), dioxins, lead, and arsenic, which can lead to a variety of conditions, ranging from kidney damage to cognitive decline, cancer, and even death.26Simonetta, C., N. Ademollo, T. et al. (2005): Persistent Organic Pollutants in Edible Fish: A Human and Environmental Health Problem. Microchemical Journal, XI Italian Hungarian Symposium on Spectrochemistry, 79, no. 1–2 (January 2005): 115–23. Fish bred on aquafarms do not present a healthier alternative. After all, they are treated with antibiotics and chemicals to fight parasites and skin and gill infections – which are all consequences of the unnatural farming conditions. Not only are fish able to feel pain, they also possess complex cognitive skills and social structures. Additionally, fishing and fish farming have negative impacts on the environment and our health, all of which makes fish an unsustainable source of food. A fundamental change in mindset is needed in view of the exorbitant fishing quotas and the burden placed on the environment, nature, and the fish populations themselves. The availability of plant-based products similar to fish is on the rise. From vegan fish burgers to caviar, calamari, prawns and shrimp, there is an alternative for every occasion. 3. ↑ R. W. D. Davies, S. J. Cripps, A. Nickson, and G. Porter (2008): Defining and Estimating Global Marine Fisheries Bycatch. Marine Policy 33, no. 4, S. 661–72. 6, 11, 20. ↑ FAO (2016): The State of World Fisheries and Aquaculture 2016: Contributing to food security and nutrition for all. Rome. 14. ↑ R. E. Engeszer, M.J. Ryan and D.M. Parichy (2004): Learned Social Preference in Zebrafish. Current Biology 14, no. 10, S. 881–884. 15. ↑ C. Brown (2015). Fish Intelligence, Sentience and Ethics. Animal Cognition 18, no. 1, S. 1–17. 16. ↑ L. U. Sneddon, V. A. Braithwaite, and M. J. Gentle (2003): Do Fishes Have Nociceptors? Evidence for the Evolution of a Vertebrate Sensory System. Proceedings of the Royal Society B: Biological Sciences 270, no. 1520, S. 1115–1121. 17. ↑ Heath, A. G. & G. M. Hughes (1973): Cardiovascular and Respiratory Changes During Heat Stress in Rainbow Trout (Salmo Gairdneri). Journal of Experimental Biology 59, no. 2 (October 1, 1973): 323–38. 19. ↑ H. Segner (2012): Fish: Nociception and Pain: a Biological Perspective. Contributions to Ethics and Biotechnology 9. Bern: Federal Office for Buildings and Logistics. 23. ↑ Worm, B., E. B. Barbier, N. Beaumont, J. E. Duffy, C. Folke, B. S. Halpern, J. B. C. Jackson, et al. (2006): Impacts of Biodiversity Loss on Ocean Ecosystem Services. Science 314, no. 5800 (November 3, 2006): 787–90. doi:10.1126/science.1132294. 25. ↑ Gerstenberger, Shawn L., Adam Martinson, and Joanna L. Kramer. “An Evaluation of Mercury Concentrations in Three Brands of Canned Tuna.” Environmental Toxicology and Chemistry 29, no. 2 (February 2010): 237–42. doi:10.1002/etc.32. 26. ↑ Simonetta, C., N. Ademollo, T. et al. (2005): Persistent Organic Pollutants in Edible Fish: A Human and Environmental Health Problem. Microchemical Journal, XI Italian Hungarian Symposium on Spectrochemistry, 79, no. 1–2 (January 2005): 115–23.